I finally made it through this lovely 2-mission campaign. Played it on expert difficulty. I loved how you valued the player for exploration. In both missions, some parts are only reachable by the roof/ by jumping/ by roping up to certain places.. The first mission was]short, but lovely. It was an intro mission for the following giant. A bit too easy for my preferences, but this may be a subjective judgement. 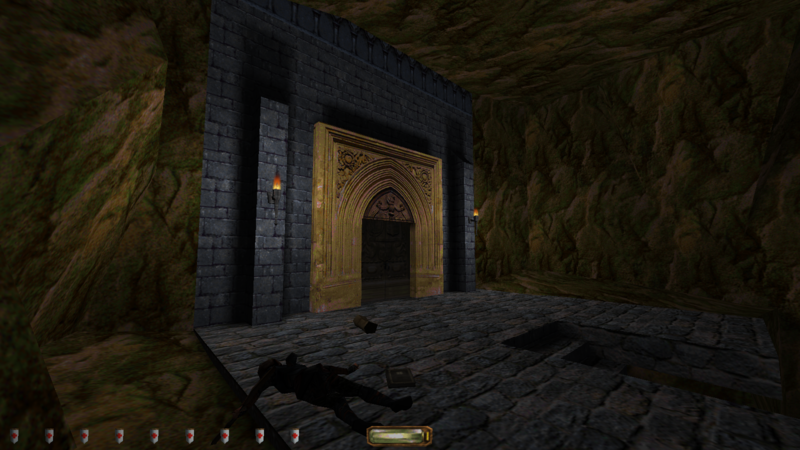 In these wide rooms the enemies could be easily avoided. But I had fun by climbing on the rooftops - it was absolutely necessary! After some time I finally got the elevator to the tombs working. The second mission was a true monster. The further I descended, the further this maze grew. And here the player got valued for exploration too. The one who risks a junp will be rewarded. I liked it even more than the first mission. My absolute favourite riddle was the riddle for Lady Brennans amethyst medaillon. Very clever! After nearly two hours of exploration I finally made it into Saint Tennors tomb. And I thought I finally did it - but no, the particular artifact was not there. I realised, that another giant part was coming. So, after some searching I finally made it to a precursor settlement. The temple was very clever designed. Front door was closed, so the player had to search for another entrance. And then the second floor seemed to be inaccessible. Again here - the one who climbs and explores, will be rewarded. Luckily I didn´t wasted my water arrows. And finally this time it got the artifact in question for sure. Overall, I found roughly 4.700 of 5.700 in loot. It seems I still missed a big chunk somewhere. This campaign - and especially the second mission - created the most thiefy feeling I ever had in a mission of this contest so far. Therefore, this campaign shall be rewarded with a 10/10 rating. I am confused. In expert difficulty the player has to enter the alarus extension in order to escape the catacombs since the elevator is broken. There is a platform on the other side of the rear room, but it seems to be inaccesible. Is there the bow upgrade located? Too bad I didn´t found the secret in the first mission. Taffers, if you made it here consider yourself lucky. Last edited by Thinking Robot; 10th Dec 2018 at 10:49. Last edited by Azaran; 10th Dec 2018 at 15:01. Azaran, the collector tower is the magic light pole on the east side of the roof. Was the "Begone if you have stolen" deadly maze supposed to be solved by trial and error, or did I miss a crucial hint somewhere? @Haplo There are regular statues and death statues. You can spot the latter by their skull-faces. You can't walk between them. Thanks marbleman. For me that room was too dark to be able to see the difference in the faces. how can i repair the elvator? One readable (or even two) gives You almost straight hint. You can attach a rope to the texture around the top of the tower. If you look in the wall next to the generator, you can see that a gear is missing. You need to replace the gear. So, did You ONLY switch the power to start the generator, or also gives a drive transfer by the gear/cog?. has anybody a hint whre i can find this missing piece for the generator room ? Examine the molds available in the workshop. You'll know what to do. Try a place where Richard used to worked. You need to have a key, but... another readable next to THE door says where to find it. Nice pair of missions! Love the combination of different types of gameplay. Also I have to say being chased by the guardians of Midas's tomb gave me a scare I haven't had in a long time playing Thief FM's! Last edited by radogoal; 14th Dec 2018 at 22:47. This is the way to end the level 1 and go to level 2, so every of the other objectives must be fulfil first. for The Author - It should be less confusing. When elevator hits the bottom and go up, our charactrer should mention something like: "Ahh I have not finished yet. Better I'm going back and deal with my other things first" or something like that. I think there was even similar line Garrett says in one of original mission? Last edited by Mat99; 14th Dec 2018 at 23:40.
oh ok i check it.